Someone once told me that, in France alone, a quarter of a million letters are delivered every year to the dead…What she didn’t tell me is that sometimes the dead write back. These lines set the tone for a dramatic visit to Lansquenet, a rural village in France. Vianne Rochet, known for near-magical skills with chocolate, returns after an eight-year absence in response to a letter she receives from a deceased friend. The formerly Catholic village now contains a sizable Moroccan population, and the town is straining to contain two distinct communities. 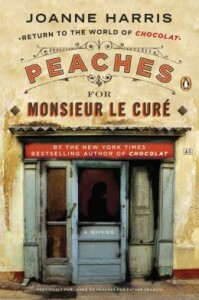 Peaches for Monsieur le Curé (or Peaches for Father Francis) by Joanne Harris has been honored as the 2014-2015 selection for the Suburban Mosaic program, which seeks to foster cultural understanding through literature. Ultimately, it is a wonderful story that blends enchantment and real-life conflict in a way that will touch our hearts and remind us what we all have in common.